What exactly are zero copy techniques and how these techniques can be employed to achieve better performance in distributed system ? If you browse the Hadoop MapReduce and Spark JIRA tickets, you will find a number of tickets related to the use of zero copy techniques such as MMap memory mapped files and sendFile() to improve the system. 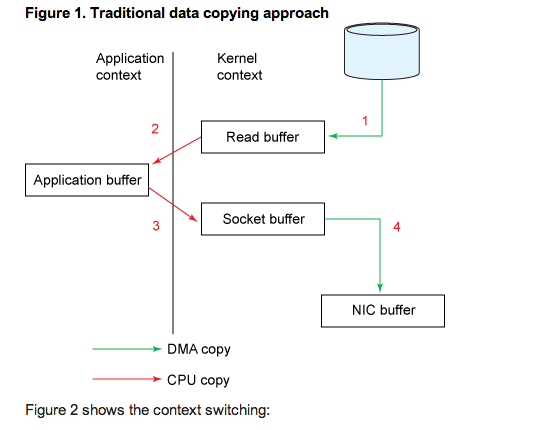 Zero copy techniques are these techniques used to eliminate unnecessary data copy and context switches across application and kernel space. Please refer to the following excellent post for an in depth explanation of these techniques. A popular zero copy technique is called sendFile() or transferTo. Please see the following figure. (taken from the same paper). 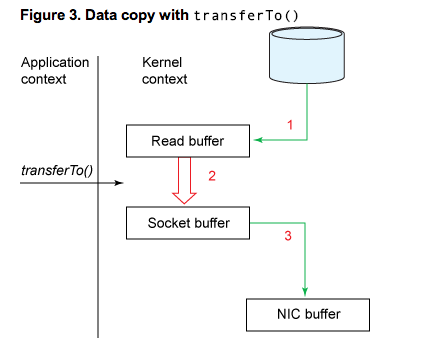 As you see in Hadoop, it has already reverted to use zero copy transferTo way back in version 0.18. In Spark, there is also plan to use the same technique in sending shuffle files, targeted for upcoming version 1.2.0. Spark-2468 : introduce the same transferTo technique in sending shuffle files. In the last few posts about Hadoop MapTask spill mechanism, we learn that Hadoop uses an in memory buffer during the map task intermediate output writing phase. As the memory soft limit exceeded, it starts spilling the data to disk. This results in multiple spill files that are eventually merged together at the end of the map task into a big file. During the spilling process, the data in the memory buffer are first sorted by the partitions (each partition corresponds to one Reduce task) and then by the keys. As of Spark 1.01 version, Spark Map Tasks write the output directly to disk on completion. There is no use of an in memory buffer. Each Map Task writes as many shuffle files as the number of Reduce Task. One shuffle file per Reduce Task. Eg. one could have 1000 Map Tasks (M) and 5000 Reduce Tasks (R), this results in 5 millions shuffle files. Spark does not however merge them into a single partitioned shuffle file as in Hadoop MapReduce. This number of file IO somehow affects the performance. You can learn more about Spark shuffling from the following report. In the above report, it also points out the potential memory issue when using compression on the Map output files. eg. In a machine with C number of cores allocated to Spark, we have C concurrent Map Tasks, each Map Task is writing out R shuffle files, one per Reduce Task. The total number of memory usage would be C*R*400KB. Here comes the good news. A new shuffling mechanism, called sort-based shuffling is implemented for upcoming Spark version 1.1.0. You can read the design document below and learn more about this issue in SPARK-2045 JIRA ticket. This sort-based shuffling is quite similar but not the same as Hadoop MapReduce shuffling.